Ah, the humble soybean. It gives me enormous respect for Japanese culture to see all that they have achieved with this rather unpromising bean (to say nothing of all the other skills and treasures of Japanese culture). Tempeh and tofu are very much on our menus at present, too. 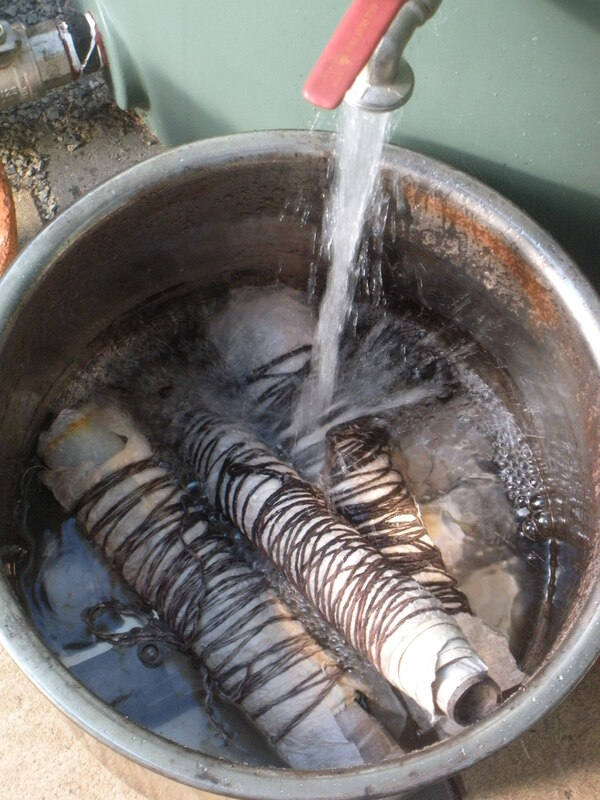 I am just using it to mordant cellulose fibres ready for leaf prints, nothing as complex as tempeh, or even tofu. Usually I dip the fabric in the sea first when I’m visiting someone by the sea and then dry it and then begin with beans, but not this time. I forgot to take the cloth when I went visiting at Hove and the beans were already soaking. I measure out 3 cups of beans to every kilogram of fabric. I soak the beans overnight, grind them finely and dilute, then strain out the solids. Then, it’s dip and dry at least three times. So this week I made the most of hot weather: 4 dips on a single day. 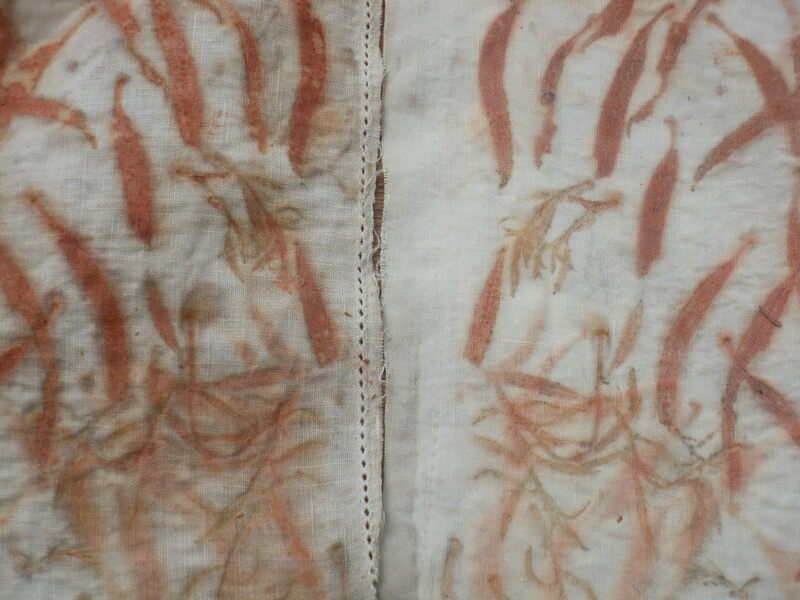 These pieces of cloth are destined to be dyed by those who attend my dyeing workshop in January. It isn’t a difficult process to mordant this way, but there are a few steps to it. I’ve decided to try mordanting in advance in the hot weather of summer. Drying fabrics that have been through this process in winter is pretty trying and makes this a 4 day process, by the end of which the soymilk smells less pleasant. Mind you, even then, it takes about 5 minutes a day of actual effort for me! Next, I’ll be testing one of these out to make certain sure there will be a good result on the day of the workshop. And perhaps, doing some more mordanting while the weather is perfect for it, as part of working toward taking advantage of the seasons to do the work that is most suitable to the weather and conditions. 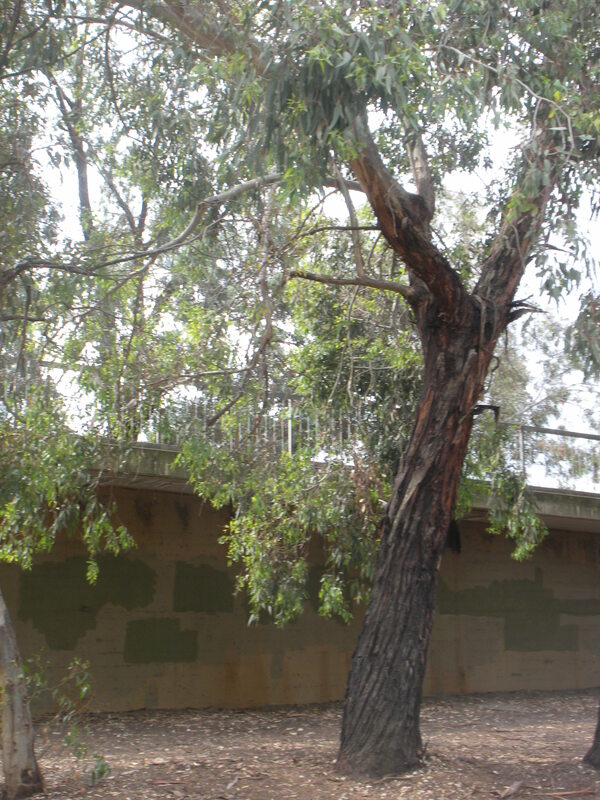 I decided to depart from my recent focus on ironbarks to try to identify this lovely tree, growing alongside the tram line. 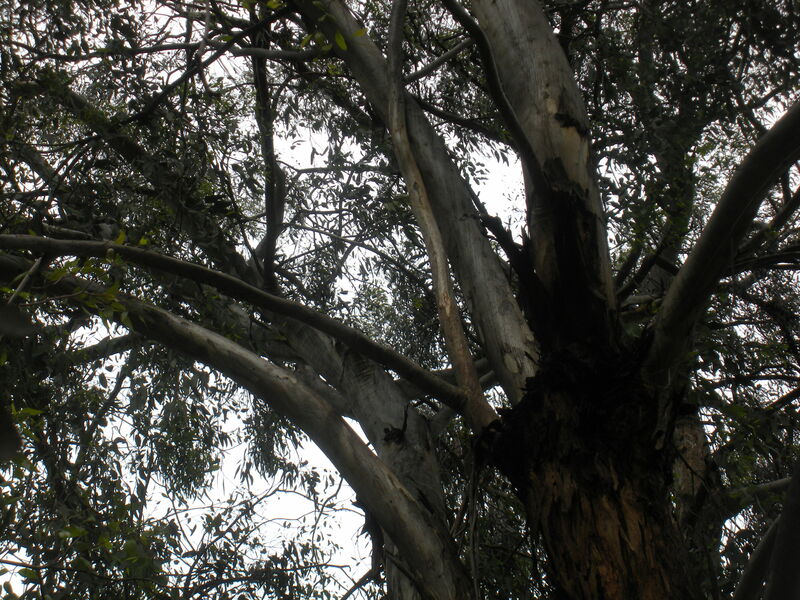 This one is not an ironbark… it is a stringybark. Here’s a bit more detail. 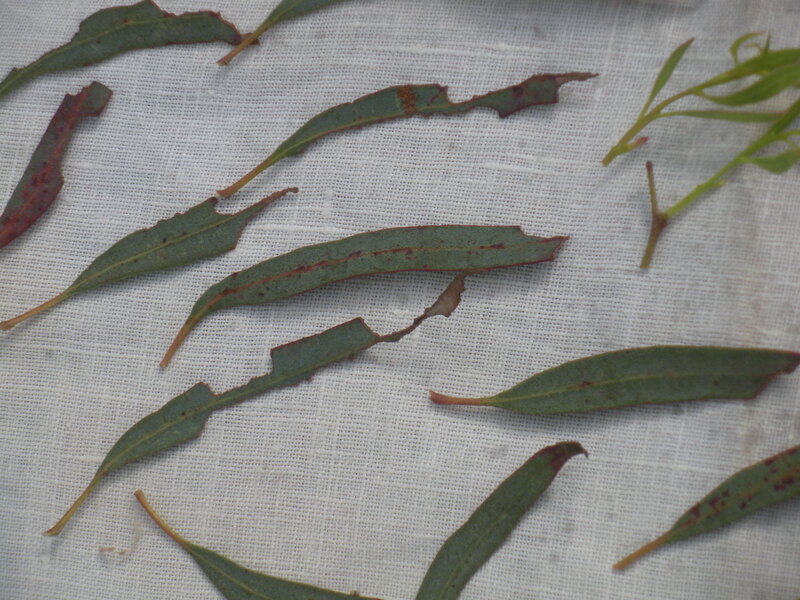 All the usual reservations about my skills in eucalypt identification apply, but Euclid and I reached the conclusion this is E.Acaciiformis, wattle-leaved peppermint. I ran a test pot last week and got a strong, bright orange… so I’m trying out a bigger pot. I’ve been running pot after pot with the same water and fresh bark over the last few days, but for this, some fresh, clean rainwater. 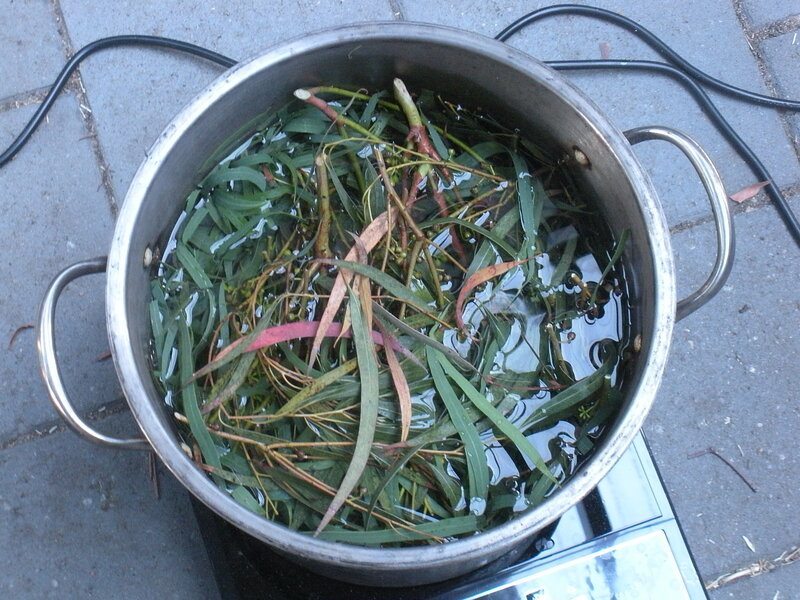 I brought the pot up to below a boil, then simmered for three hours, adding my fibre after the first hour and taking out leaf material after the second to allow more room for fibre circulation in the dye bath. This is the result on merino and silk (on the left). 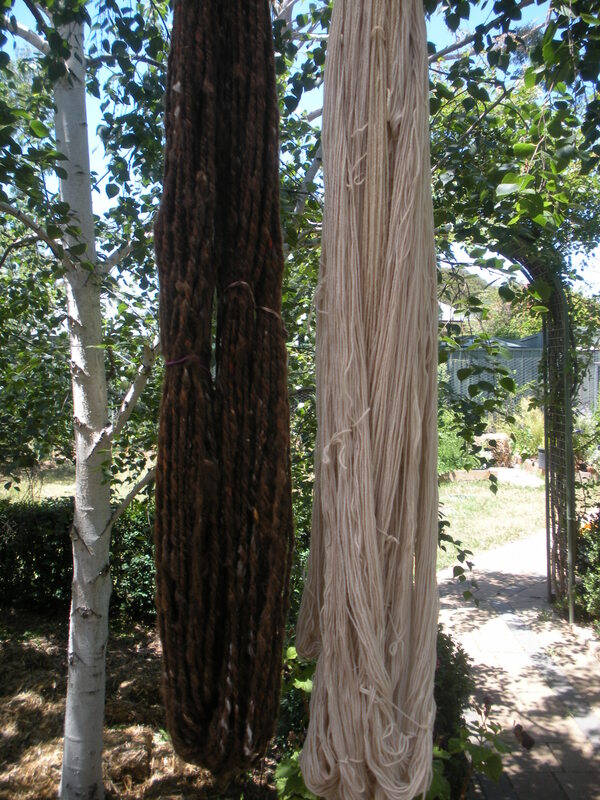 The braid on the right has been dyed with E Scoparia bark. 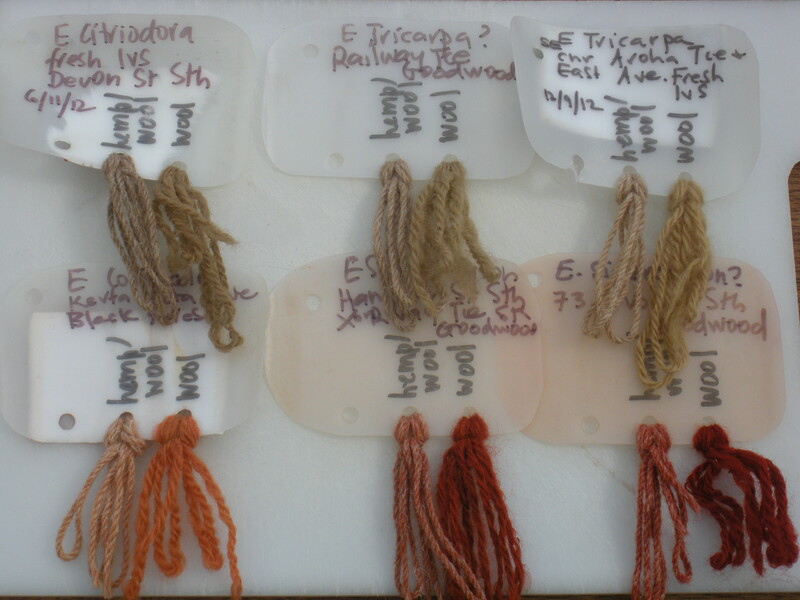 It is quite striking to see the difference between dye take up on the wool and the silk. 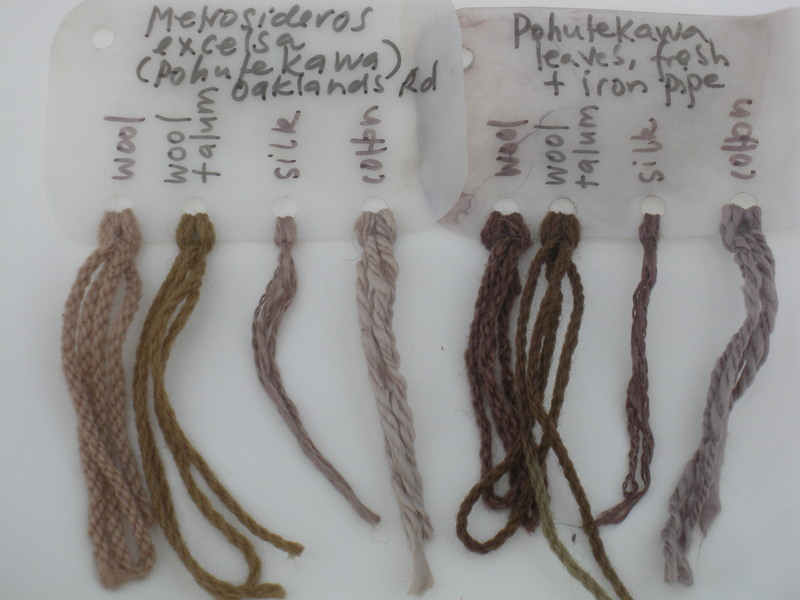 All my sample cards suggest this outcome, and so do leaf prints really: I get colours I prefer on wool and cellulose fabrics rather than silk personally, though I see that other dyers love using silks. 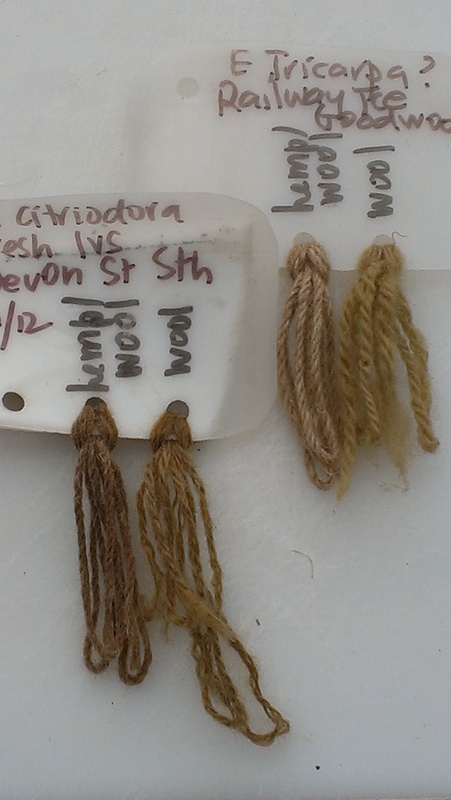 It does seem very different to the usual expectation about how these fibres will take up dyes. 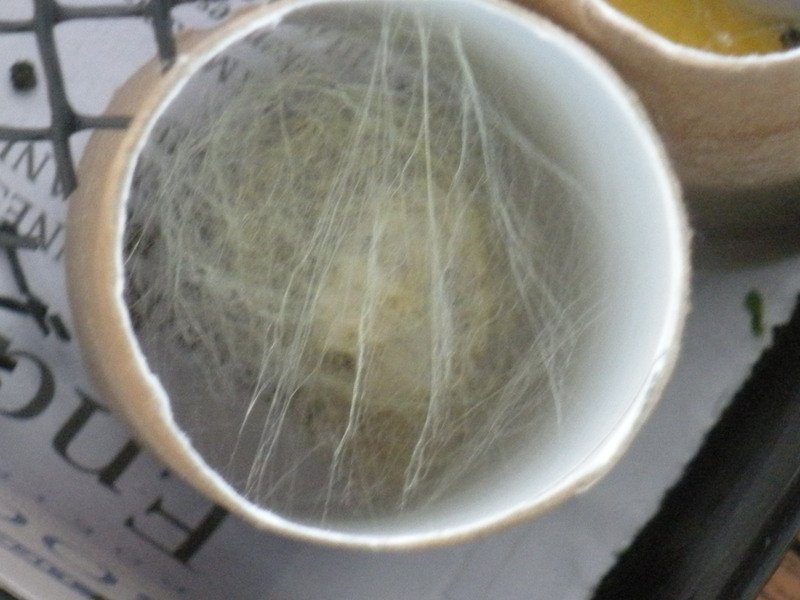 Yesterday I got up to find that two of the cocoons were open and there were two silk moths in our kitchen. 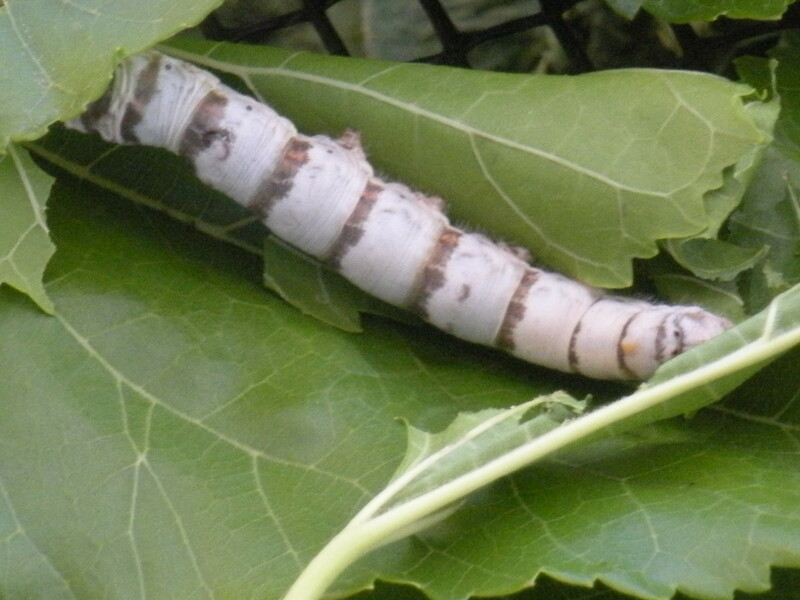 A while back, I mentionedthat I had acquired some silkworms. Five for a dollar, to be exact! There I was, checking out the primary school community garden during their fete and admiring the plants for sale, when I saw them. So, they went into a strawberry punnet and came home on my bicycle. Then began weeks of raiding local mulberry trees for stray overhanging leaves (and there were some from my friend’s front yard too). Since it is mulberry season, I got some food from the whole adventure too, and some berry-stained fingertips. Now, we are waiting to see when they emerge and what happens them. It may be that with a posse of only 5, there will not be opportunities to reproduce. But we’ll wait and see. I’ve been puttering along on a number of different projects over the last few weeks… and lest this sounds unusual in some way, that is probably the way life goes most of the time around here! I returned to cold dyeing roving after retrieving my last spectacular failure. 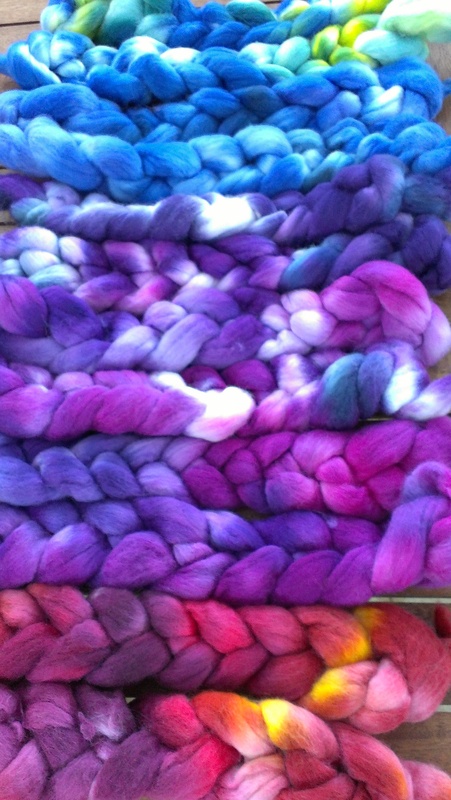 For good measure, I also dyed some local mohair locks. I am planning toward a textured yarn spinning workshop and I’m determined to go as close as I can to a local supply of materials for the participants. 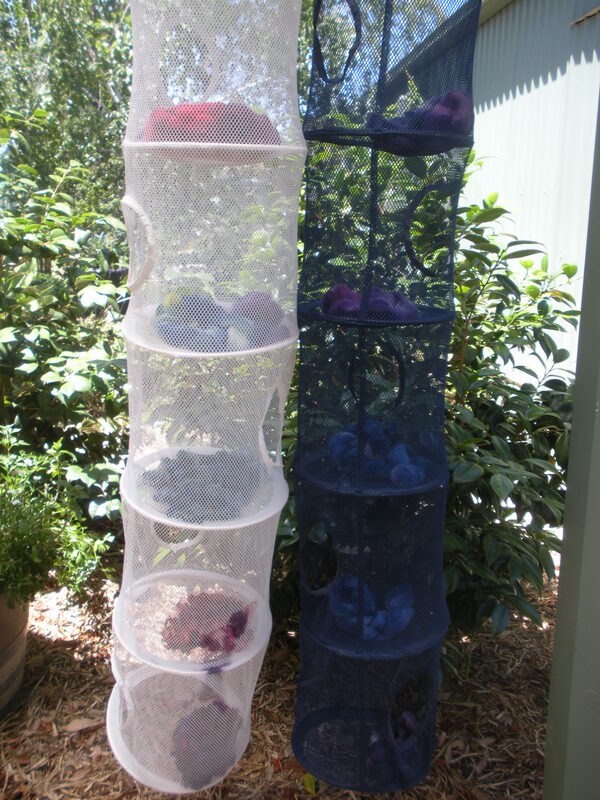 We’ve had Ikea here for long enough that the op shops of the city now turn up these fantastic wool drying apparatuses. One came with a small supply of plastic animals. This time, just when I thought I had found them all, a small plastic dalmatian dropped out. Hopefully the child whose toys left home this way is not grieving and bereft! This time, the merino braids turned out better than I had hoped. Perhaps I am slowly acquiring a better sense of colour. Those with a red base (at the bottom of the picture) were the ones I felt most tentative about, but I like them best of all. The mohair is ready to have seed heads picked out of it and to become part of some textured batts for corespinning and other good times. 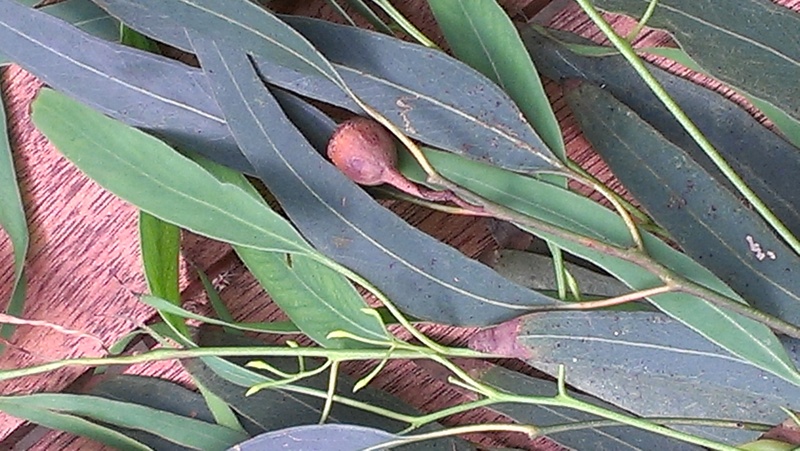 Meanwhile, I have been preparing for a natural dyeing workshop focusing on eucalypts. Again, I need to provide materials, so I’ve been laying in what I need. 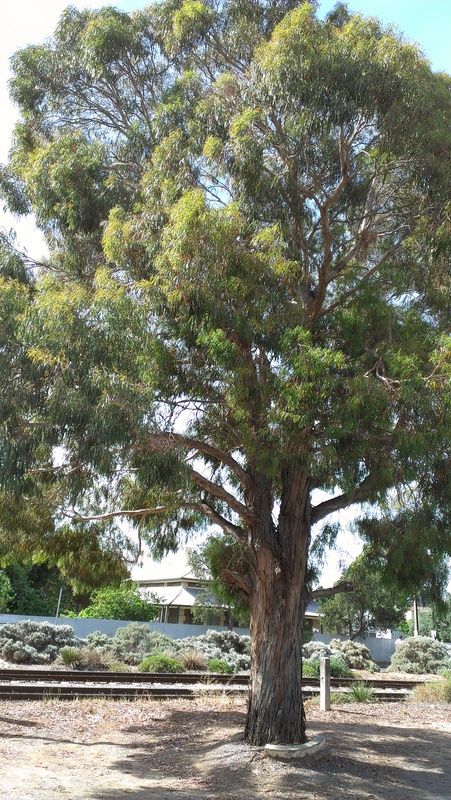 It’s the season for bark collection so I have been touring the neighbourhood with my trusty bike trailer and a chook feed sack, pulling over if I’m passing in the car, or wandering out with a bucket, whichever may be appropriate to the day and location of the tree. 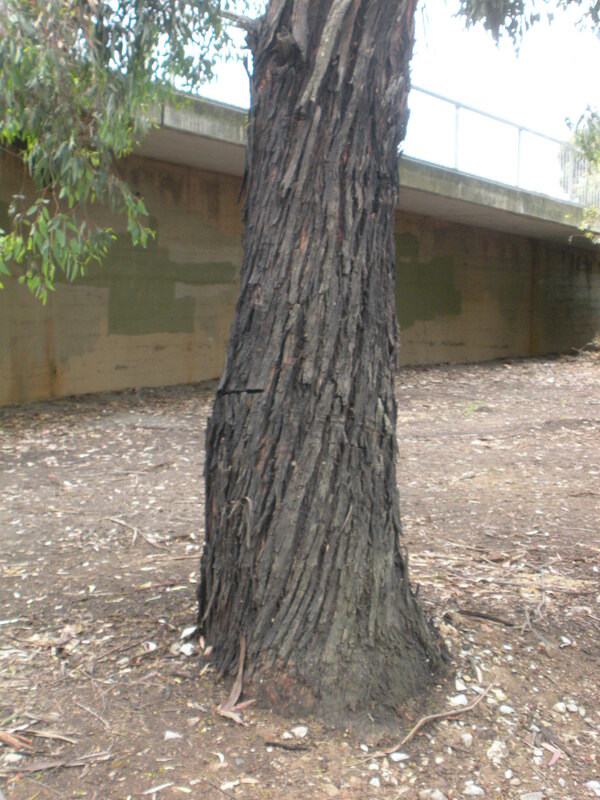 In short, I am keeping the E Scoparia bark that is falling to the ground from being blown away, tidied up by others or crushed on the road. I have almost 3 sacks full so far. Seeing the bark shedding has allowed me to run test dye pots on a few trees I had been unsure of with more confidence. I’ve found several more specimens in the local area. Meantime, I have been mordanting fibres (wool with alum on the right) and continuing to convert my sow’s ear fibre into slipper-suitable yarn (left) as I knit up what has already been spun. I think that particular batch of unlovely spinning may finally be over. Two pairs of slippers are knit, one to go. 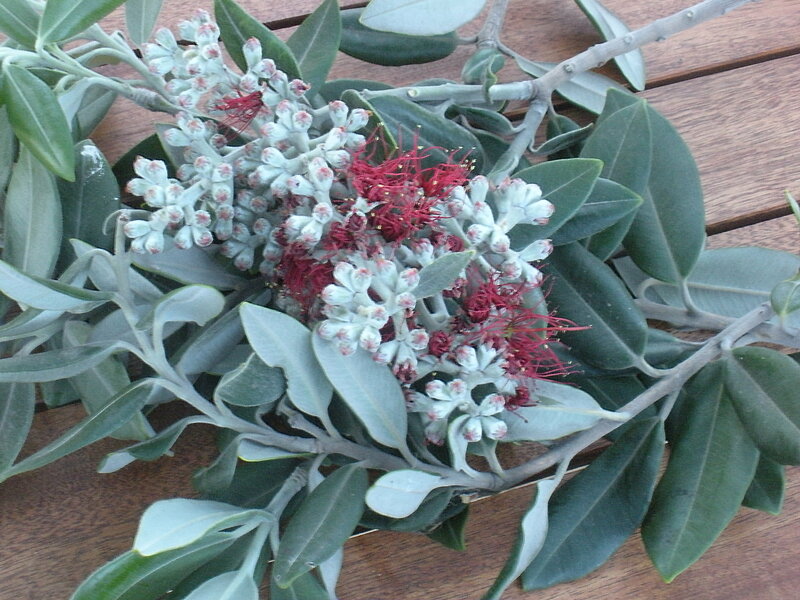 Pohutukawa (Metrosideros Excelsa; known in Australia as New Zealand Christmas Tree) is a native plant from New Zealand, which is grown in Australia as a street tree, particularly in seaside locations. In New Zealand/Aotearoa I saw it growing right on the beach, gloriously. It is a hardy and beautiful tree. 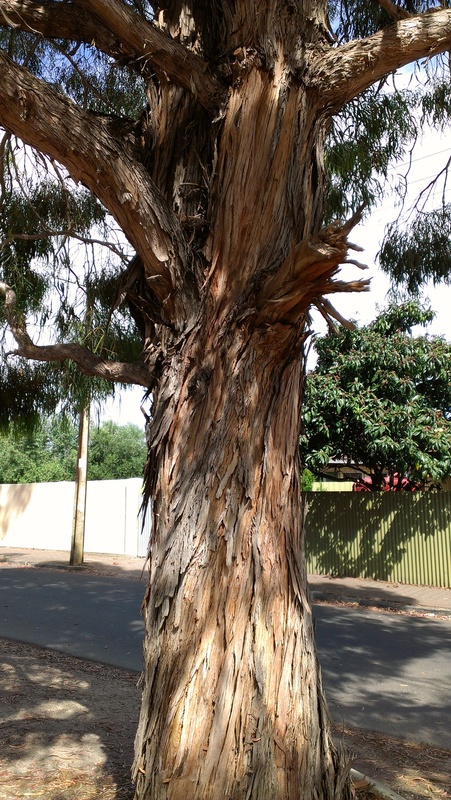 I came past dozens of them on Oaklands Road (a main road in the southern suburbs of Adelaide) yesterday and pulled over. I was immediately approached by some people who were looking for Marion Pool, so I gave some directions while I was there harvesting. I was keen to try dyeing with the leaves of this tree because I’ve leaf printed with them on wool and found the colour almost purple. 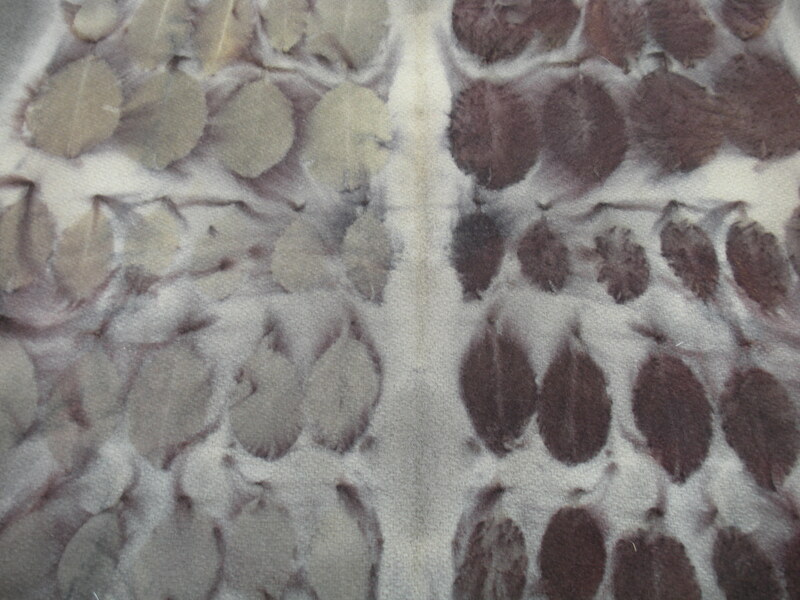 These leaf prints are on a strip of cream-coloured woolen blanket. 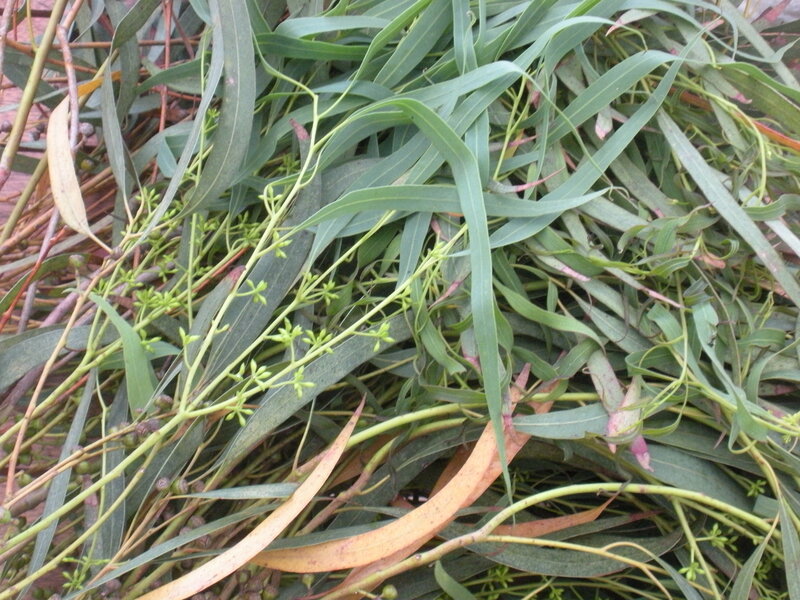 The leaves are green and glossy on one side and almost white and slightly fluffy on the back. One side printed pale green and the other, deep purply-brown. Or perhaps the purple part is in my imagination. 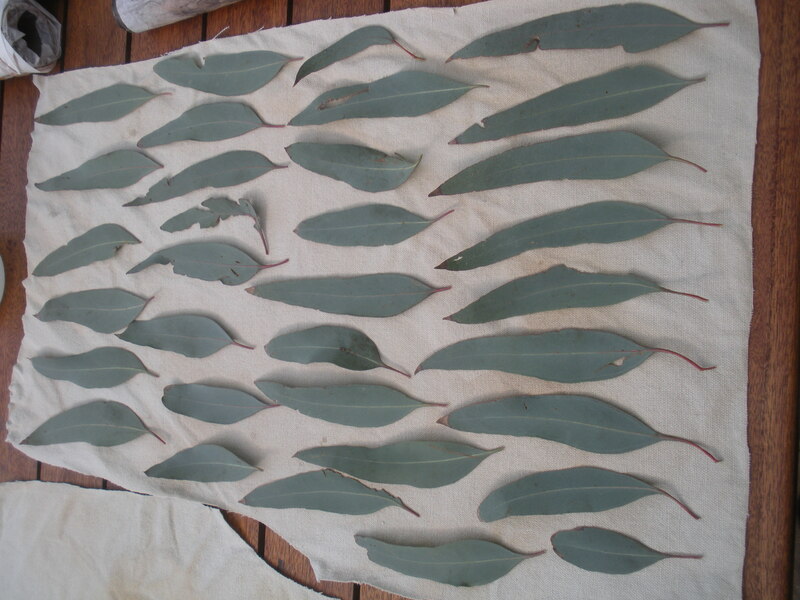 These leaf prints were cooked with a set of eucalyptus prints, so for about 3 hours. It is possible a shorter time would be better for these leaves, though they are tough too. Searching the web and Ravelry for clues yesterday though all I found were browns. Undeterred, I went ahead with two test dyebaths. I cooked one with the leaves alone in rainwater and one with leaves, rainwater, and a trusty piece of iron pipe. I cooked them for an hour at a light simmer and left to cool and sit overnight. The olive green (or is it khaki) on alumed wool with leaves alone is interesting, but if there are exciting colours to be coaxed from these leaves, clearly I’ll have to try another method. 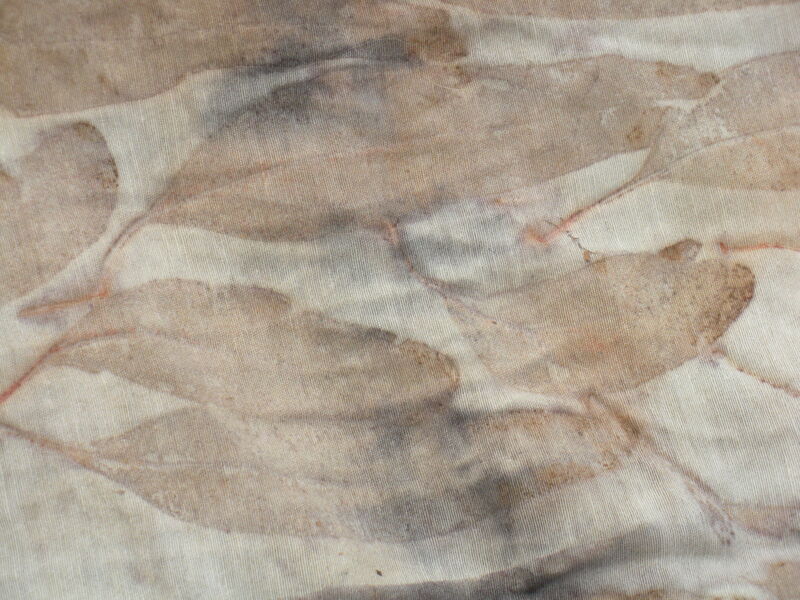 For now, leaf prints are the best result I have achieved. 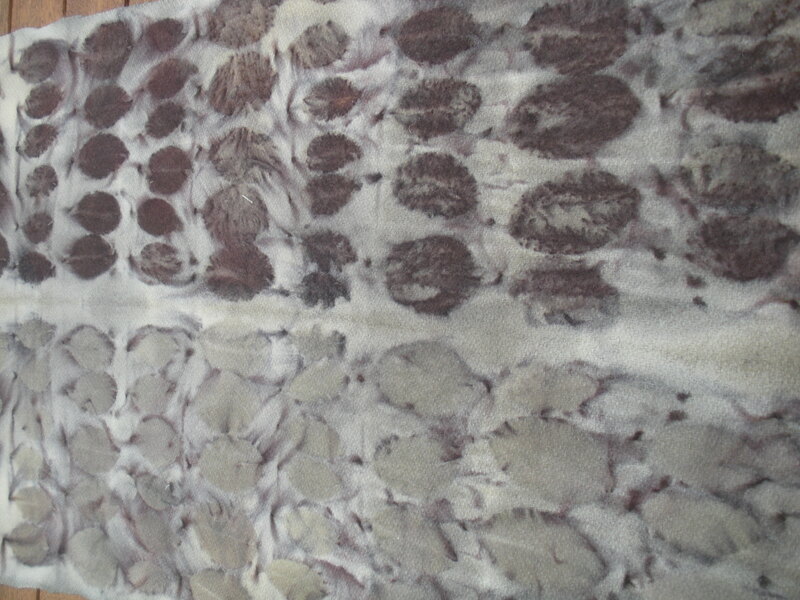 Leaves alone in rainwater (left) and leaves, rainwater, and iron pipe (right) with wool; wool + alum; silk; cotton). 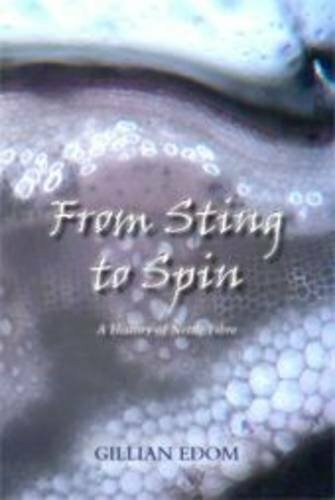 After my recent failed experiment in processing nettle fibres, I bought Gillian Edom’s self published book From Sting to Spin: A History of Nettle Fibre (Urtica Books, Bognor Regis, England, 2010, ISBN 978-0-9565693-0-1). This is a slim volume which brings together the evidence for the textile uses of nettle with a strong focus on Europe and on the stinging nettle, Urtica Dioica. Gillian Edom examines archaeological evidence from ancient times through to the second world war. She considers Indigenous peoples’ usage of nettle fibres briefly as well as discussing the huge number of different plants which collectively make up the nettle family. She has also gathered intriguing quotes about nettle fibres from literature, fairy tales, scientific writing and even religious works. I found this account of the historical record very interesting. Edom concludes that though there are many references to the use of nettle fibre in European history, very little can be conclusively demonstrated about the historical use of nettle fibre from the physical evidence alone. It is clear that while ramie (Boehmeria Nivea) has been and continues to be produced in commercial quantities, stinging nettle has proved resistant to industrial-scale production despite numerous attempts, particularly during the straitened circumstances of the world wars in Europe. 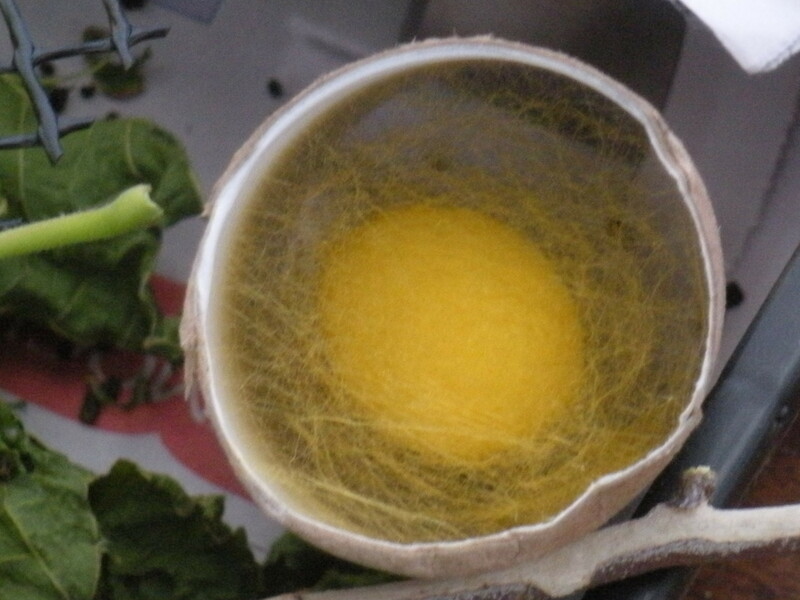 Unfortunately for me, there is very little information in this work about how to process nettle fibres, though there are clues and some basic instructions. There are also references to the methods of those who have tried to process nettle in the past, setting out parts of the process used in different parts of Europe at different times. They make it clear that while some people have succeeded in making high quality yarns and fabrics from nettle and nettle blends, many attempts have produced a poor quality product. 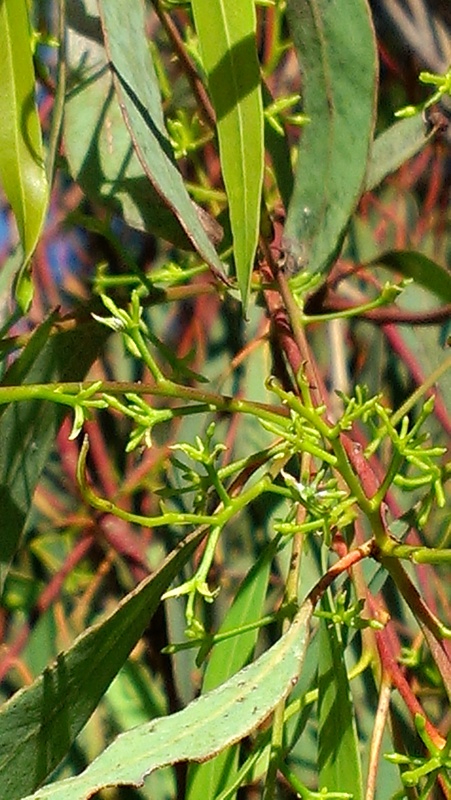 Removing the woody parts of the plant has proved challenging for many who have attempted the task. Anyone… may experiment and call on the experience of others and that of our ancestors, to prise the lovely fibre from the hated stinging nettle in our own back gardens (page 55). I would have been delighted to have a little more concrete advice from others who have succeeded where I have–so far–failed. However, Edom has inspired me to try again when the season is right. Alongside all these yarn samples, I made leaf prints. I sprayed my fabrics in vinegar (as India Flint recommends in her beautiful book Eco-Colour: follow the link on her blog and support her that way if buying online: it is in the left hand sidebar). 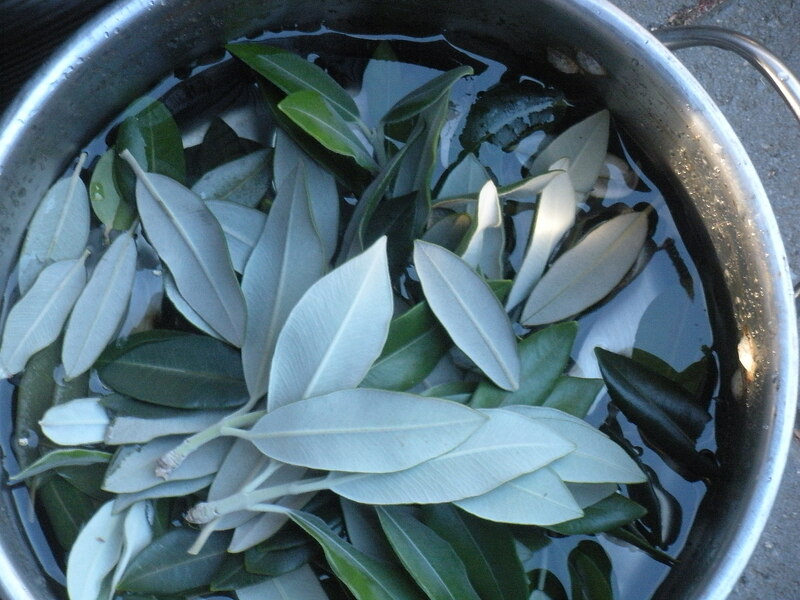 Next, I sandwiched the leaves between two layers of fabric, wrapped them tightly around cast iron pipe and cooked them in rainwater for about three hours. Here is my suspected E Scoparia before cooking: I got a small sample and only what I could reach, and when I got it home, there was a lot of evidence of insect activity! 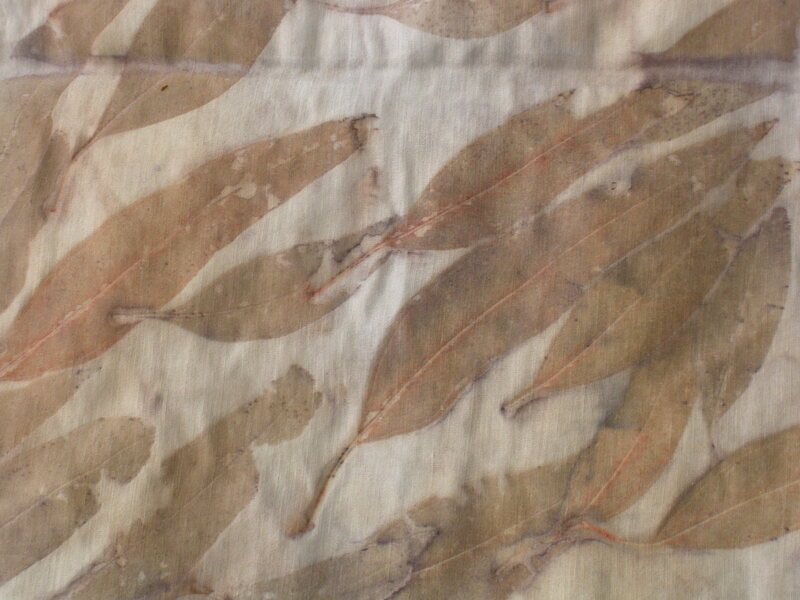 I am planning to make a leaf-printed shirt, but I am a bit scared. I mordanted this fabric months ago. I have a great pattern. I did not expect this fabric to have one silk face and one hemp face, and I can’t decide which is the’ right’ side. So I set up one sample on the silk face and one on the hemp face. Here are the results. So… I think the silk side might be the ‘right’ side. Feel free to offer alternative opinions! And I might use a different tree for the shirt prints when I gather my courage.